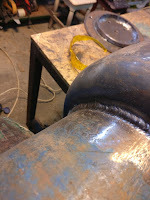 In this project i'm welding an waster oil burner that will heat up water for a friend. My friend brought the parts tacked together and some parts and i'll make the final welds. The first thing that i've done for this build was to enlarge the holes that he made so i could fit the connectors and have a better water flow. - the parts were tacked together and i didn't want to separate them. - i don't have a drill bit that big. 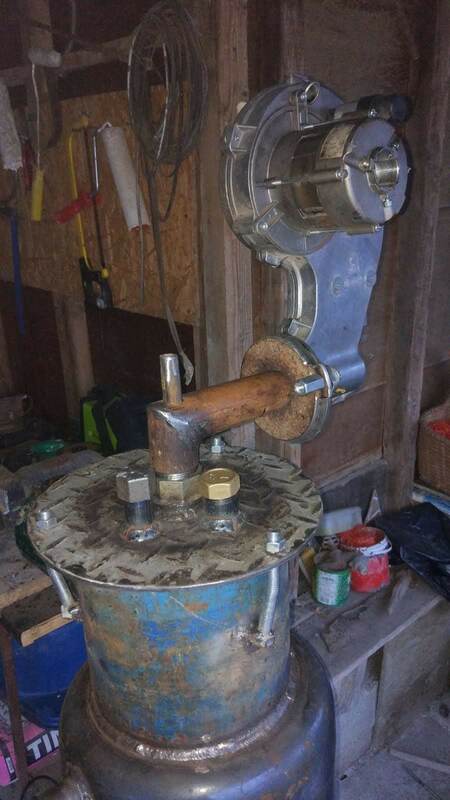 I have a metal hole saw that will do the job just fine but to use it i have to improvise something to guide it. I couldn't use the drill part of the hole saw because the hole drilled by my friend it's bigger that the bit. So i've welded a piece of pipe to guide the metal hole saw and this trick worked great. 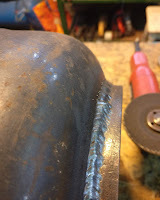 After welding the connectors the next step was to temporary remove the chimney connector so i can prepare the metal parts for welding and make the welds. 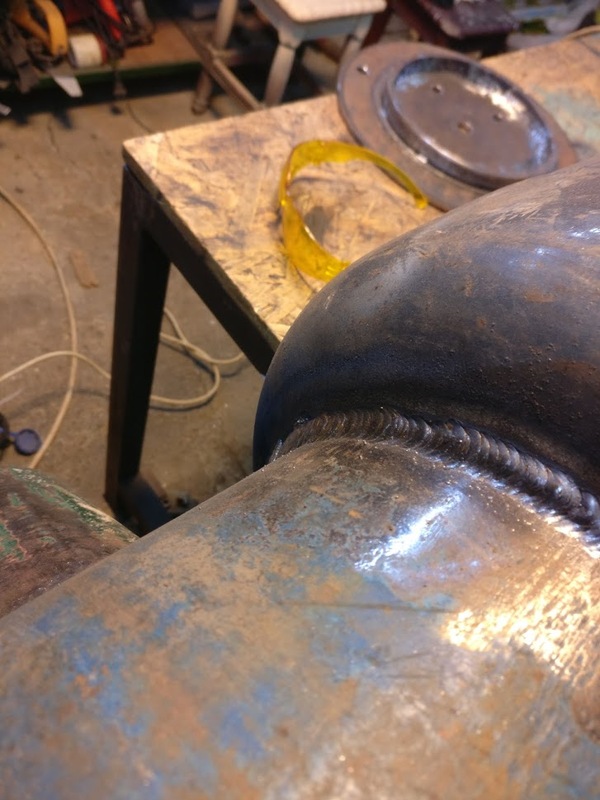 After welding the top and bottom part of the water boiler i've reattached the pipe that will be the chimney connector and weld it. After all the welds were done i've pressure tested the water boiler connecting my air compressor line to it. 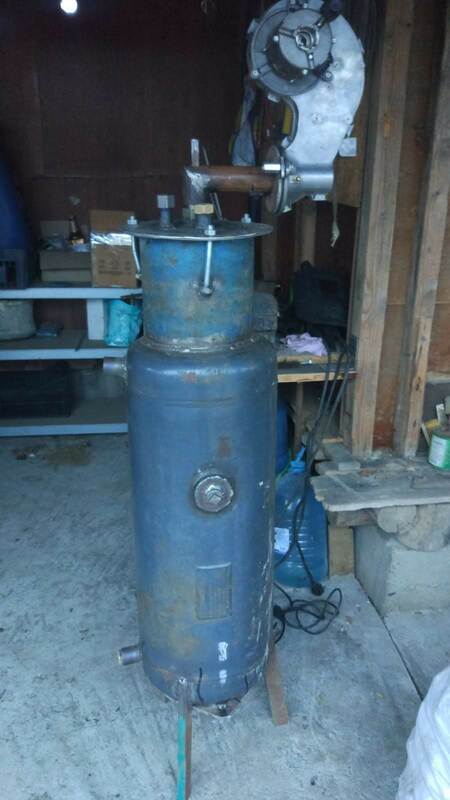 I've tested the boiler up to 5 bar (almost 80 psi) and there were no leaks, but i'm sure that it could maxed out my compressor without any problems. The burner it's made from a pipe with several holes drilled. The first set of holes are near the bottom of the burner, 16 of them - 4 mm. Followed by 2 sets of 8 holes - 4mm and at the end are 8 holes but they are in zig zag cross pattern. Update: 3 holes - 2mm at the bottom (check the photos below). On this pipe there are 3 pieces of threaded rod and with 3 coupling nuts the burner can be centred inside the water boiler. On this pipe the fan it's connected and through this pipe the oil it's feed to the system. - 16 holes on the first row. - 8 holes one next 3 rows. In the video the last row of holes it's in a zig zag cross pattern, but i don't know how to do that in sketchup. The results are impressive but there are some bits that need to be finished and then this solution will be used to heat up a house.